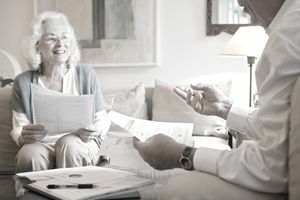 Owners of individual retirement accounts who are at least age 70 1/2 can contribute some or all of their IRAs to charity. Why would they want to when they've been making contributions for years in anticipation of the day when they would retire? They do it because it can be advantageous from a tax perspective in some situations. If you have a traditional IRA, you must begin taking required minimum distributions (RMDs) when you reach age 70 1/2 even if you neither need nor want the money at that point in time. When you take these distributions, they're taxable at ordinary income rates—whatever tax bracket you're in that particular year. If you fail to take them, it's worse. In most cases, the tax rate skyrockets to 50 percent of the amount you were supposed to take but didn't even though you didn't have the use of that money. A qualified charitable distribution (QCD) is a distribution from an IRA directly to an eligible charity, bypassing the owner of the account so he's not taxed on it. QCDs count toward your required minimum distribution for the year. If you have to take RMDs but don't really want or need the money, QCDs are a good way to distribute the minimum required amount out of the IRA and avoid the penalty. This rule applies only to traditional IRAs, not Roth IRAs. If you have basis in a nondeductible traditional IRA, any QCDs you make are considered to come out of taxable IRA funds first. Normally, distributions are split proportionately between taxable funds and nontaxable basis. The key benefit of a QCD is that the distribution amount is not included on your Form 1040 as income. That's a good thing, but there's a bit of a downside, too. The QCD cannot be used as a deductible charitable contribution if you itemize your deductions. That would be something of a double tax break for the same transaction. QCDs can only come out of traditional IRAs. They cannot come out of SEP IRA or SIMPLE IRA plans. Although it's possible to take a QCD out of a Roth IRA, there's generally no advantage in doing this because Roth IRA distributions are typically already tax-free. The more tax-efficient move would be to use a traditional IRA to fund the QCD. Because income from a charitable distribution "bypasses" the 1040, QCDs can be used to help keep your adjusted gross income and taxable income within a desired range. This can help prevent income from reaching the thresholds for the net investment income tax or the phaseout range for itemized deductions. QCDs can benefit seniors who take the standard deduction rather than itemize because there's no tax benefit anyway in making a donation to charity when you claim the standard deduction. You're not losing anything by making the QCD. For non-itemizers, donating to charity via a direct transfer out of an IRA is the only way to get a tangible tax benefit from their donation. You must be at least 70 1/2 years old at the time of the qualified charitable distribution. The funds must be directly transferred from the IRA custodian to the eligible charity—and "eligible" is an important word here. The charity must be one that is approved by the IRS. You can't simply turn the money over to your neighbor. Eligible charities include 501(c)(3) organizations and houses of worship. Donor advised funds and so-called supporting organizations are not permitted to receive QCDs on a tax-advantaged basis. The maximum amount that can be donated through a qualified charitable distribution is $100,000 per year per IRA owner.